Mars’ atmosphere could have been rich in oxygen four billion years ago – well before Earth’s air became augmented with the gas. That is the suggestion put forward by the author of a study in Nature journal, which outlines an explanation for differences between Mars meteorites and rocks examined by a robot rover. Dr Bernard Wood said the idea fits with the picture of a planet that was once warm, wet and habitable. But other scientists were sceptical. 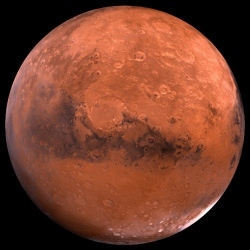 While the rise of atmospheric oxygen on Earth was probably mediated by life, Martian oxygen could have been produced through the chemical "splitting" of water. Prof Wood and his colleagues from Oxford University looked at the chemical composition of Martian meteorites found on Earth and data from Nasa’s Spirit rover, which examined surface rocks at Gusev Crater on Mars. Both are igneous rocks (of volcanic origin), but they show major geochemical differences. For example, the Gusev Crater rocks are five times richer in nickel than the meteorites. This had posed something of a puzzle, casting doubt on whether the meteorites were typical volcanic products of the Red Planet.